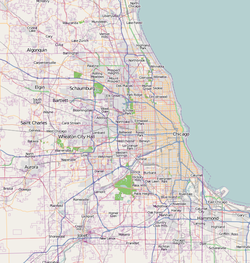 Lyons Township High School (often referred to as LTHS or simply LT) is a public high school located in Western Springs, Illinois (South Campus), and also in La Grange, Illinois (North Campus). Lyons Township is a co-educational high school and serves grades 9–12 for Lyons Township High School District 204. Students from the communities of LaGrange, Western Springs, Burr Ridge, La Grange Park, Countryside, Indian Head Park, Hodgkins, and parts of Brookfield, Willow Springs, and McCook attend Lyons Township. Lyons Township High School is the 8th-largest public high school in Illinois and the 46th-largest public high school in the United States. Freshmen and sophomores attend class at South campus, located at 4900 S. Willow Springs Rd. in Western Springs. Juniors and seniors attend class at North campus, located at 100 S. Brainard Ave. in LaGrange, which also houses the district offices. Sports facilities at Lyons Township include swimming pools, field houses, theatres, a turf football field (south campus), soccer fields, baseball fields, a gym, outdoor tracks, basketball courts, and volleyball courts. The two campuses are about a mile apart. Activity buses run after school between the campuses. Lyons Township High School was opened on September 4, 1888. The enrollment included 39 students. An athletic field named Emmond Field was constructed in 1888, and a 1926–1929 expansion included a clock tower, auditorium, offices, library, and a gym. Leonard H. Vaughan (president of a seed company and former school board president,) funded the construction of the Vaughan Building; it was constructed in 1949 for sporting events and classes. In 1956, South Campus was opened about a mile south-west in nearby Western Springs to accommodate the community's growing population. The Corral was constructed in 1944 as a social place for all students to spend time with each other after school hours. In 2005, a performing arts center, a field house, and a pool were added to the South campus to complement the facilities at the North campus. At LTHS girls compete in basketball, cross country, golf, gymnastics, soccer, swimming, diving, tennis, lacrosse, track and field, volleyball, badminton, softball and water polo. Boys compete in baseball, football, cross country, wrestling, golf, soccer, bowling, basketball, swimming, diving, track and field, lacrosse, water polo, tennis, and volleyball. LTHS is the license holder of WLTL-FM - a Class A non-commercial radio station which broadcasts from North Campus on 88.1 FM. WLTL has won several national and local awards, including the Service to Young Children award. The station is student-run, with new student managers selected each year. WLTL is the recipient of more than 25 awards of excellence, including the John Dunn award for "Best High School Radio Station in the Nation" and has had 10 consecutive years winning the Communicator Award. WLTL has also been recognized nationally for the quality broadcasting that it provides by the National Association of Broadcasters. Several current media figures got their start at WLTL, including Mike Murphy of WSCR, Dave Juday of WMVP-AM, Ryan Arnold and Emma McElherne of WXRT-FM, and Phil LeBeau of CNBC. Throughout the year, students arrange multiple small events for the school as well as the community. Such events include the All School Assembly, Relay For Life events, Computer Drive, Secret Santa, Rockathon and various other student run events. Matt Rehwoldt, professional wrestler who performs as "Aiden English"
Frederick Upton helped organize Upton Machine Company, early manufacturer of electric washing machines, forerunner to Whirlpool Corporation. Leona Woods, physicist who helped build first nuclear reactor and atomic bomb; At age 23, she was youngest and only female member of team that built and experimented with world's first nuclear reactor Chicago Pile-1. ^ "Lyons Township High School Profile" (PDF). Retrieved March 28, 2018. ^ "LTHS Illinois Report Card". Northern Illinois University. Retrieved March 28, 2018. ^ "2017 Largest Public High Schools in Illinois". Niche. Retrieved July 25, 2017. ^ "2017 Largest Public High Schools in America". Niche. Retrieved July 25, 2017. ^ "Leonard H Vaughan, Seed Company Head, Dies at summer home". Chicago Tribune. September 12, 1943. Retrieved November 9, 2015. ^ "About LTHS / History of LTHS". www.LTHS.net. Retrieved July 25, 2017. ^ "Athletics / State Champions". www.LTHS.net. Retrieved July 25, 2017. ^ "LION Newspaper - The voice of Lyons Township students for more than 100 years". www.LionNewspaper.com. Retrieved July 25, 2017. ^ "WLTL 88.1 FM LaGrange". WLTL 88.1 FM LaGrange. Retrieved July 25, 2017. ^ "LTHS Net Activities". LTHS.net. Retrieved July 25, 2017. ^ Smith, Bryan. "Behind the Beanie Babies: The Secret Life of Ty Warner". Chicago magazine. Retrieved 31 July 2018. This page was last edited on 17 April 2019, at 03:17 (UTC).